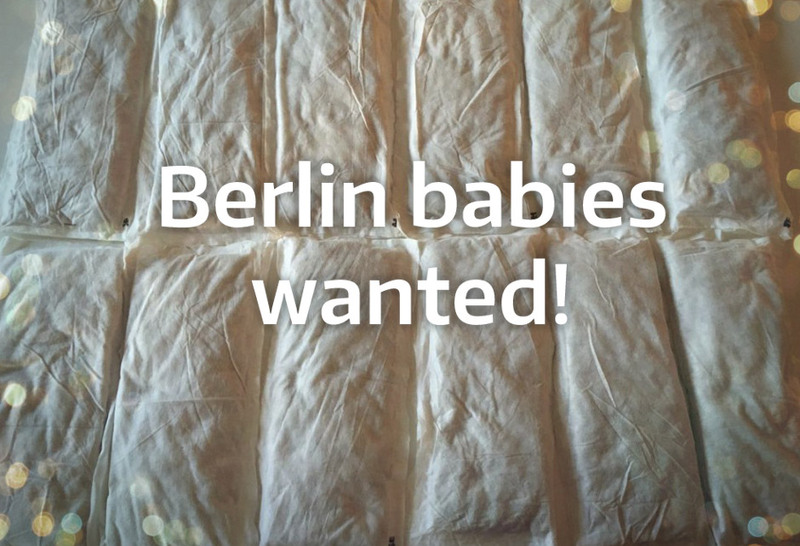 We are looking for 50 Berlin based families with babies who would like to test our 100% compostable diaper inlays for 2 or 3 days. The project will create small communities of around 100 families each living in the same neighbourhood, meeting regularly at the diapers distribution/collection points, planting fruit trees together, living their lives in a more connected way. We believe that many people’s small change in everyday life can bring bigger changes afoot – strengthening communities from the bottom up. Disposable diapers are a known environmental hazard comprising up to 10% of household waste. 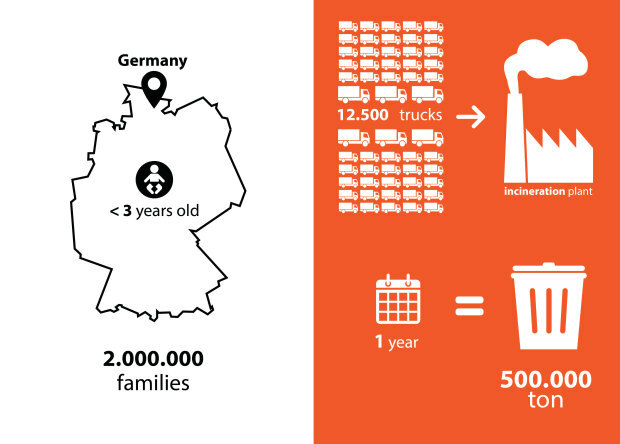 Each child produces around 500kg of diapers waste in their first two and half years of life that translates into around 1400 litres of crude oil used for plastic components according to DYCLE’s estimations. The CO2 and methane gas footprints are high. Just the diapers impact is 12 tons of CO2 emissions per child, without taking into account transportation, packaging and other. 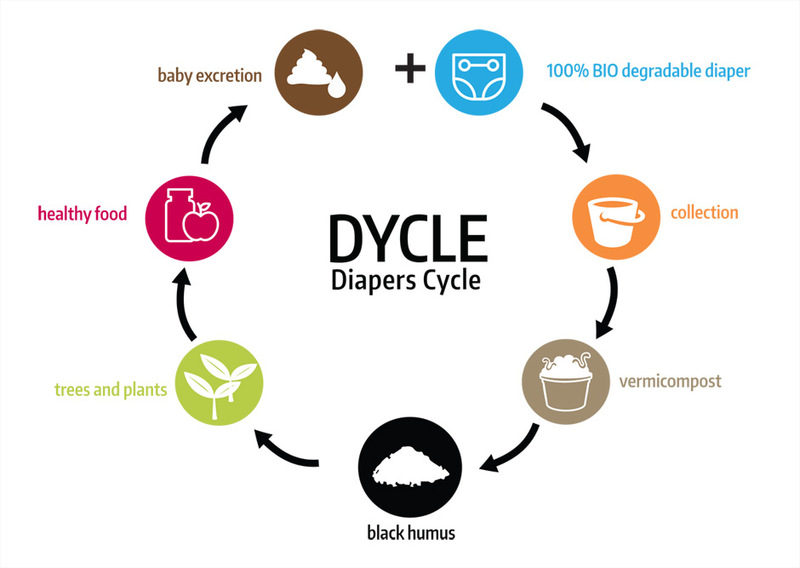 DYCLE supports parents who want to take a sustainable approach by using compostable diapers, through a diapers collection system and converting diapers waste into black soil, which will subsequently be used for growing trees and plants locally. As a diaper is full of baby waste, it contains excellent nutrients in a form of phosphates and nitrogen, and it degrades into hygienic and fertile black earth. Harvest from the trees could be procured for baby food and juice production, thus closing the nutrients and materials cycle of baby diapers. 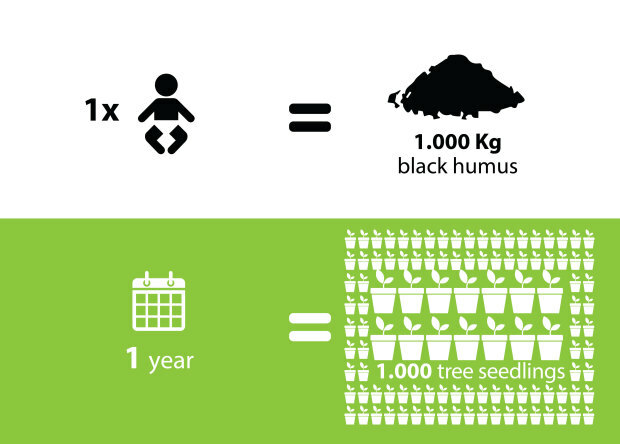 DYCLE estimates that a 1000kg of black earth can be produced from one year’s supply of diapers from a single child. DYCLE has already proved feasibility of diapers collection and soil production process with a pilot project in May 2015 with 100% compostable diaper inlays and September 2017 with our DYCLE diaper inlays. We would like to hear from you hello(at)dycle.org (or use our contact form). If you would like to be informed about news and future activities, please subscribe to our humusletter. When do we start? How can I participate? Read our FAQ - Frequent questions and answers.